It seems a bit early for pondering Christmas presents but, trust me, it’s not. If you have a passionate food lover in your near vicinity you might want to ditch the summer holiday brochures for half an hour and consider a masterclass. There is a compelling reason why your Christmas (or birthday / anniversary / graduation / retirement) gift shopping should start now when daffs are still fresh in the park: Cinnamon Collection masterclasses are popular and sell out fast. They offer classes for those interested in preparing vegetarian specialities; the Barbecues and Roasts days are bound to draw a crowd; Secrets from the Southern Indian kitchen will teach you how to make a stunning biryani; and November offers a game masterclass with Vivek Singh himself. Limited places for that one. All masterclasses are not created equal. 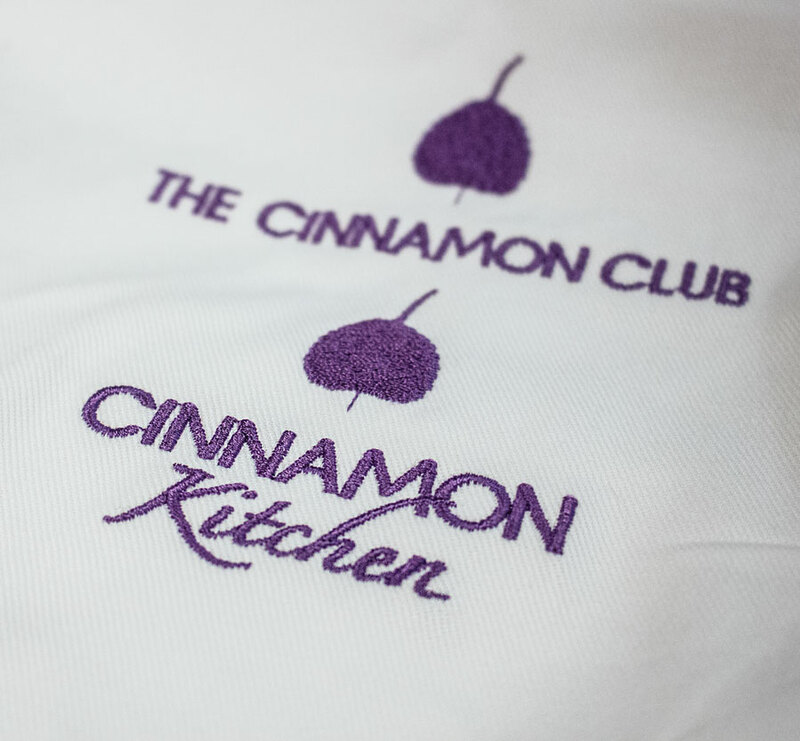 The Cinnamon Collection classes have the guests actually cooking. But the day starts in European fashion with coffee and croissants, some history of these outstanding restaurants, Health and Safety instructions, and allocation of aprons. Almost collectors’ items, these embroidered beauties carry the company logo, making a fine souvenir of the event …and there will be more later. The ratio of students to chefs will likely be just 2 to 3 guests with a chef or two looking after them. You won’t be expected to have professional skills and you won’t be rushed. There is no pressure and it’s fine if you just want to watch. For those who want to get stuck in there is plenty of opportunity to chop, mix, fry, braise, crumble and sprinkle. You will come away with a pack of recipes that really work; and you will be confident enough to replicate them at home. You have practised your new culinary arts all morning. Your dishes are on display. You have swelled with pride. So, now it’s time to relax with a glass of fizz in the kitchen. The chefs would have prepared sufficient quantities of all the masterclass dishes. 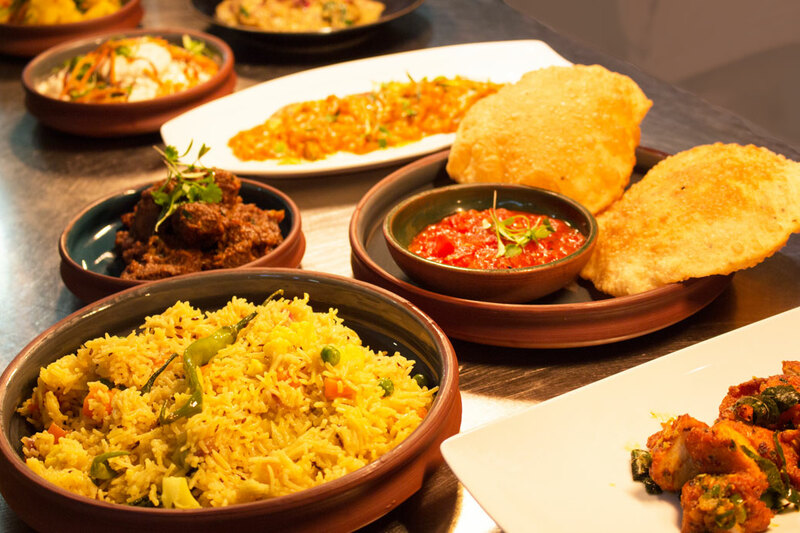 These are presented as a feast to be enjoyed by the whole group of guests around a table in the restaurant. Wine and conversation flow and there is nothing more to do, other than choose a complementary cookbook penned by Vivek who will be delighted to sign it. A final and lasting souvenir of a fun and memorable day. The Cinnamon Collection Masterclasses are thoroughly engaging. The chefs have had plenty of experience of supporting novices. It’s a thrill to work in a professional kitchen and one becomes a far more confident cook. One might not feel that a tandoor would be a worthwhile addition to the remodelled kitchen; but Indian food will probably be on the menu more often chez vous. 14th May – Vegetarian Wedding Feast with Hari Nagaraj, an excellent chef who has been with the group since its early days. He’s not new to conducting these events, and has a knack for inspiring and comforting culinary beginners. 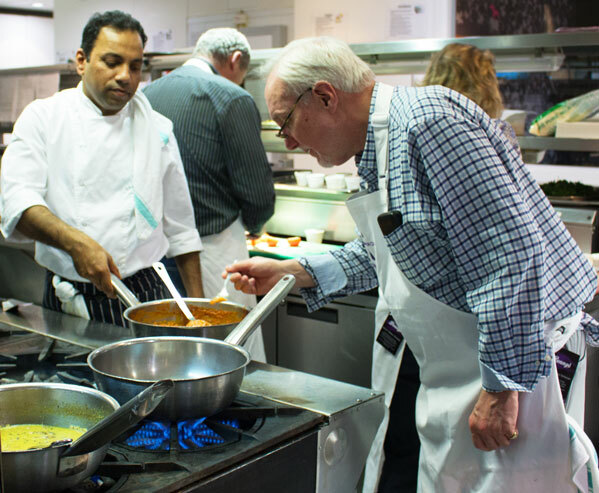 The Vegetarian Wedding Feast Masterclass teaches participants how to use traditional and modern Indian cooking methods to prepare a range of vegetarian dishes, ideal for celebrations, festive occasions and sharing with friends and family. 16th July – Barbecues and Roasts with Rakesh Nair, who is a charming and able chef with the ability to put even raw beginners at their ease. The Barbecues and Roasts Masterclass is inspired by the British love of all such dishes; recipes such as barbecued poussin with tomato fenugreek sauce, and whole roasted sea bream with green spices. 10th September – Secrets from the Southern Indian Kitchen with Chef Ramachandran Raju. He’s a pleasure to work with and always has time to offer individual help. Learn how to make the iconic biryani of black-leg chicken, and South Indian rice pancakes with spicy sambar, a traditional lentil broth. 19th November – Game with Vivek Singh, well-known celebrity chef who takes pleasure in introducing others to his cuisine. India has centuries-old hunting traditions; this class offers dishes such as chargrilled partridge with peanuts and dried mango, and green spiced pheasant with kedgeree. See more books and restaurants by Vivek Singh here.